Speakin' Geek: 'The Walking Dead' Game review. 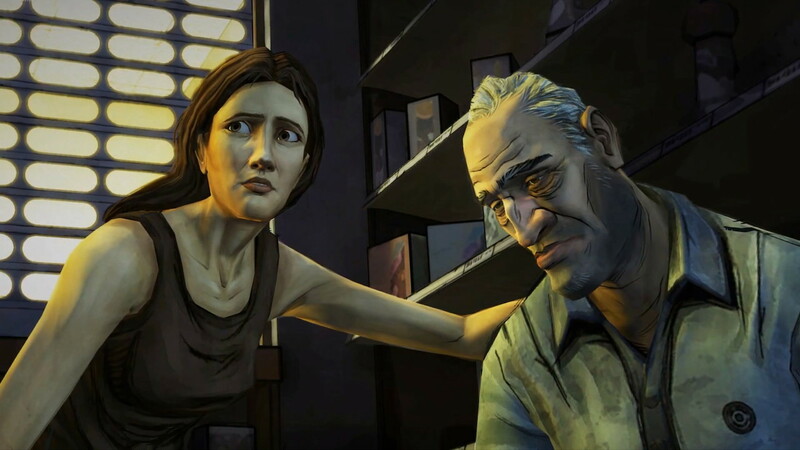 'The Walking Dead' Game Episode #1 Review. My first game review, and it is to answer a request that someone made on my youtube channel, SuperBurningson. I decided it was an excellent choice so, here we go. going by 80's horror flick rules. 'The Walking Dead' game by 'Telltale studio's' is a unique gaming experience. Not by the game-play, but by its characters, each of their emotional journeys and the consequences that come off of your choices. It is full of wonderful highs and heart breaking lows. The game-play is very much in the vain of old fashioned point-and-click games seen mostly on the PC. There is not much puzzle solving as most other games of this genre, but what the game lacks in game mechanics it more than makes up for in narrative depth and the richness of the decisions you make within the game. If you are a fan of the graphic novel, or AMC series you will instantly recognize this games style of storytelling. 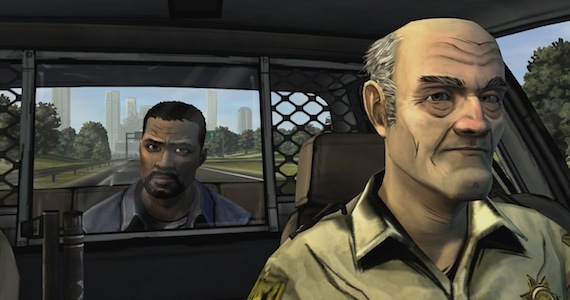 Lee Everett is a man heading to prison, after being convicted of the murder of his wife he is being driven out of 'Atlanta', which, if you are a fan of the graphic novel or series you know exactly what's going down when a helicopter is shown flying toward the city as you leave. Things go wrong pretty much from the get go and you are thrust, literally, into the action. When you really get going you begin to meet an eclectic mix of characters,including one very special little girl, who is the most endearing character to come into gaming since a certain blue hedgehog spun across our screens. The basic plot is, Lee meets a scattered group of characters and depending on your actions some like him, some don't, some die, some don't. That's just the bare bones of it. It's okay, he is a huge tool. It is a wonderful introduction to an episodic game series, it keeps you invested with it's well written characters and its snappy execution. There are honest to God moments filled with tension, humour and heartache which is unique for a game of its length. If you're a seasoned gamer I'd give you four hours maybe five, if, like me you really delved into this episode. You want the truth, there wasn't a lot of bad. One problem however did piss me off when it occurred, every now and then there were problems with the camera, which really took away from an otherwise wonderful experience.